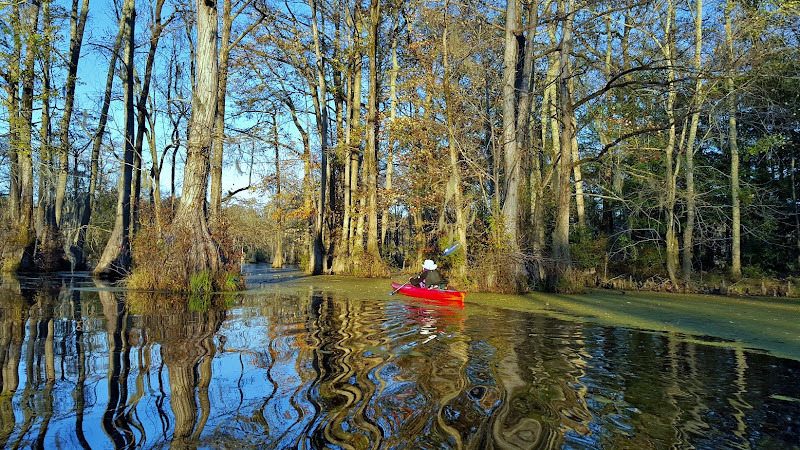 Kayak Camping at Merchants Millpond - Take a Hike! Last weekend, Sandy and I headed to northeastern NC for kayak camping at Merchants Millpond State Park. This fall has been exceptionally wet and rainy, so we were excited for a dry weekend to take our boats out. We left Raleigh shortly after sunrise and began traveling east, making it to the park around 1030. First, we stopped by the visitor center to check in and get a parking pass for the car. They didn’t have any firewood here, so we swung by the family campground to pick up a bundle. Then we drove to the boat ramp and got our stuff ready to head out onto the millpond. It was our first time taking the boats out overnight for a camping trip. With the firewood, we couldn’t get all of our stuff in the boats. So we got the tent and most camping gear in first, along with a couple pieces of the heavy firewood, and planned to come back for the rest. Once our boats were all packed up, we set off paddling across the millpond. As we got in the water, we had to paddle through some thick green “muck” along the surface of the pond that really made paddling more of an effort. But soon, we got past it and followed the orange trail towards the canoe campsite. 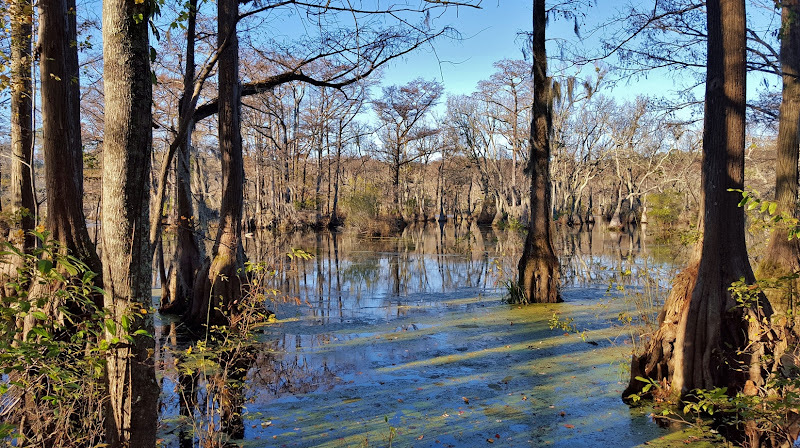 There were a tremendous number of beautiful bald cypress trees in the pond, though unfortunately, they had pretty much lost all of their leaves by now. I was able to find a couple patches of remaining fall color. When we got to the campsites, we got out of the water at camp site 1. From here, we carried our gear to site 4 and got our stuff set up. I walked down to the shore here, so I would know how to paddle back to the right campsite. Once our tent was all set up, we headed back to site 1 and got back on the water. We paddled along the yellow trail towards the group canoe campsites and then continued further into the millpond and “enchanted forest”. The many bald cypress trees sticking up out of the shallow pond were draped in beautiful Spanish moss and made for a beautiful and relaxing scene. 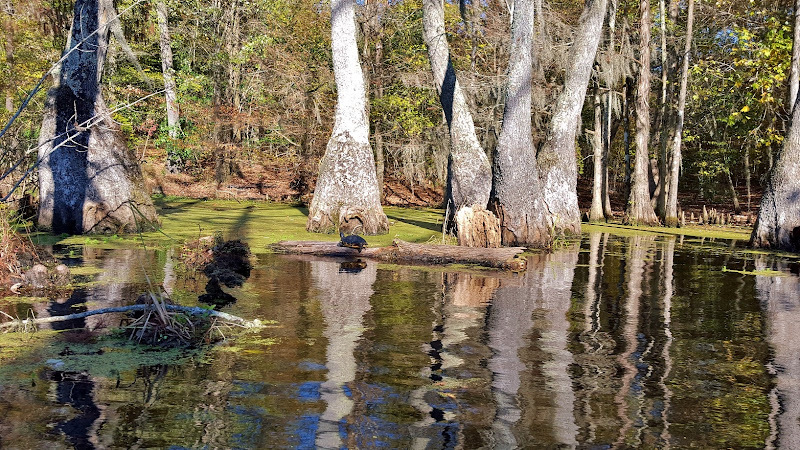 It was too cold for any alligators to be out that we could see, but we did spot one lone turtle sunning himself on an exposed log. We paddled around for a while in this area, then started making our way back to the boat ramp. We cooked dinner at the picnic area here so we wouldn’t have to hang food at the campsite and I did a quick loop around the Cypress Point Trail. After dinner, we packed the rest of our stuff and firewood for the paddle back to camp. There was about 30 minutes left of daylight when we got back to our site, so we spent that time gathering small branches and twigs to start our fire. Fortunately, there was plenty of downed wood all around the campsite. It got quite cold once the sun went down, but the campfire kept us warm until it was time for bed. It was very chilly Sunday morning when we awoke around sunrise. We layered up to get out of the tent and then packed our stuff up. Without the heavy firewood, we were able to get all our stuff on the boats and only have to make one trip back. It was a lovely morning for a paddle, even if it was chilly, and the pond was beautiful in the early morning light. Back at the boat ramp, we packed up the car and got the boats back up on the rood, then set out for a hike before heading home. From the boat ramp parking, we hiked along Mill Pond Road over the dam, where a great blue heron was wading in the murky water. Past here, a short spur trail led through the woods to the park office. After checking out, we started hiking the Lassiter Trail, the longest trail in the park. Almost immediately, we saw a deer on the trail, but she ran off before we could get a picture. The trail follows the millpond’s shore at first, crossing a wide section of the millpond on a boardwalk. The water all around here was very mucky and this area looked like the epitome of a swamp. Shortly after this point, the trail split to form a loop. Turning right, we soon passed the path that leads to the campsite where we had stayed the night before. We also saw some American Beautyberry growing here. This bush makes pretty purple berries that are popular with birds. I have a bush growing in the backyard, but this was the first time I had seen it wild. The trail then crosses the old fire roads where bicycling is permitted and then heads past Lassiter Swamp. 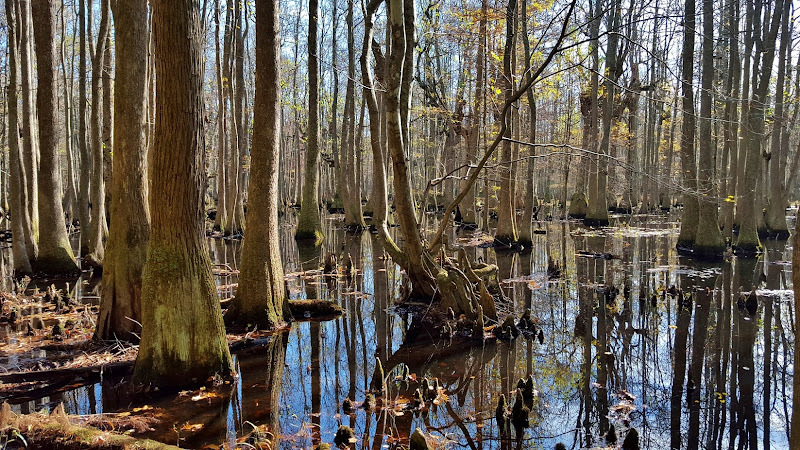 Lassiter Swamp is located near the head of the millpond where Bennets Creek flows into it. 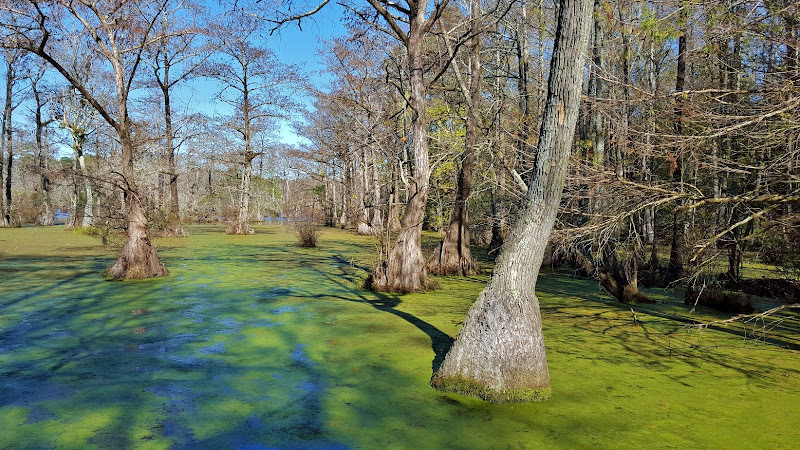 This was another beautiful area of murky water and deformed cypress trees that were gnarled into the most bizarre shapes. Along this section here, we saw a marbled orb weaver spider. I was surprised that it wasn't too cold for it. I don't particularly care for spiders, but these orb weavers have really pretty coloring and patterns. After Lassiter Swamp, the trail heads back, passing an area near private property and finishing up the loop. There were several benches along the trail to stop and enjoy the view of the forest and swamp.